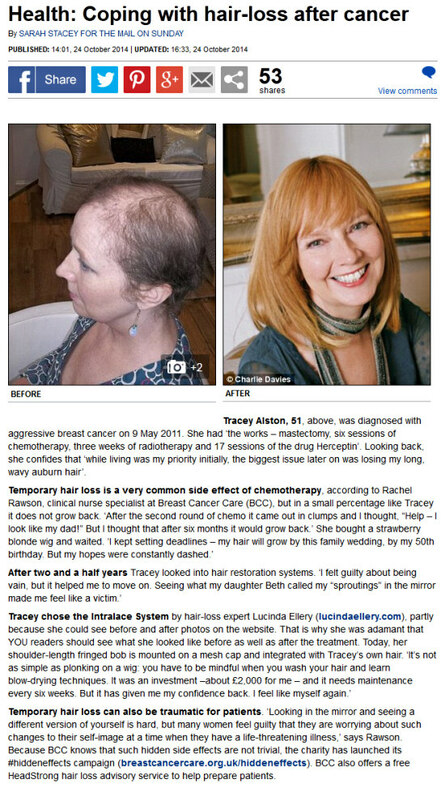 The Mail on Sunday's You magazine runs frequent Breast Cancer Awareness articles and this one featured Tracey Alston whose hair failed to grow back properly after chemotherapy and radiotherapy treatment and who came to Lucinda Ellery to have an Intralace System fitted. 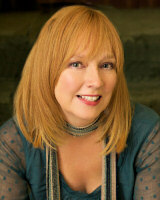 Tracey Alston, 51 was diagnosed with aggressive breast cancer on 9 May 2011. She had ‘the works – mastectomy, six sessions of chemotherapy, three weeks of radiotherapy and 17 sessions of the drug Herceptin’. Looking back, she confides that ‘while living was my priority initially, the biggest issue later on was losing my long, wavy auburn hair’. Temporary hair loss can also be traumatic for patients. ‘Looking in the mirror and seeing a different version of yourself is hard, but many women feel guilty that they are worrying about such changes to their self-image at a time when they have a life-threatening illness,’ says Rawson. Because BCC knows that such hidden side effects are not trivial, the charity has launched its #hiddeneffects campaign (breastcancercare.org.uk/hiddeneffects). BCC also offers a free HeadStrong hair loss advisory service to help prepare patients.